In 1855 a steamboat docked in St. Louis on the Mississippi River and the Brockstedt (originally spelled Brauscheidt) family of three disembarked for their new life in Missouri. John Henry (Heinrich), his wife Ulrika Christina and his son Henry Marcus (H.M.) settled down at 433 Market Street near the riverfront, where J.H. ran a grocery store and the family lived above it. In 1873, at the age of 23, Henry’s first job was as a printer with the St. Louis Dispatch Co. He married Emma Mildred Zimmer in June 1885. Emma brought a dry goods store to the marriage; perhaps that is how Henry got involved in operating a mercantile store as well as printing books. All documentation found so far points to the fact that the Ladies Art Company was established in 1889. Magazines ads in 1895 mentioned 272 quilt blocks to choose from and a catalog was published in 1897 listing 400 different blocks. The rest is history! 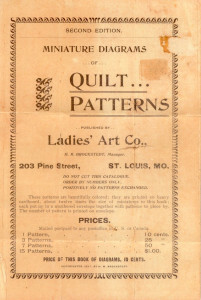 Ladies Art Co. was the first business to offer hundreds of quilt patterns in a mail order catalog. 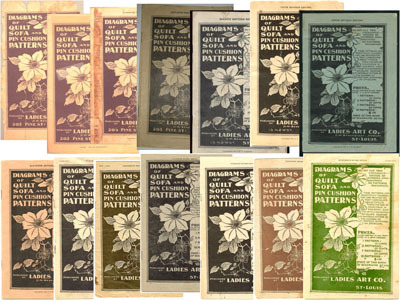 While their patterns predate the Kansas City Star patterns and others published in newspapers and books, a large majority of blocks were published in the 1880s through the 1890s. Ladies Art Company Catalogs: An edition with neither the copyright date or edition listed. an edition with only the 1898 copyright date, 3d edition, 7th revised edition, 8th revised edition, 9th revised edition through the 17th revised edition. Does anyone have the 2nd, 4th, 5th or 6th editions? The early advertisements had the blocks priced as “Quilt Patterns, 10c each; 3 for 25c; 7 for 50c.” These patterns were cut from tissue paper, and contained in a small brown envelope with a 3-inch color card of the block. 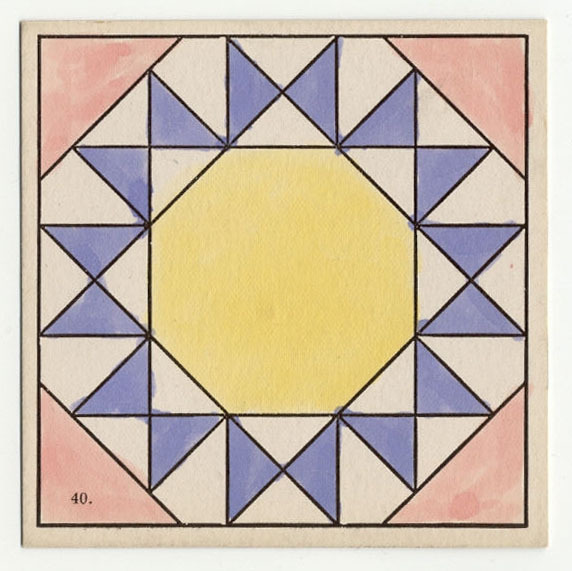 H.M. Brockstedt’s children hand painted the color cards with water colors at the kitchen table after school. 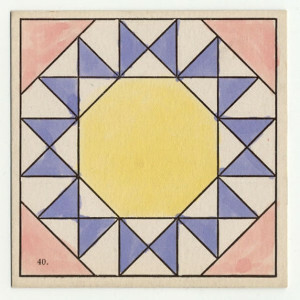 Later, as the business grew, the color cards were commercially printed. At the height of its operation in the 1930s, the Ladies Art Co. employed over 50 people. 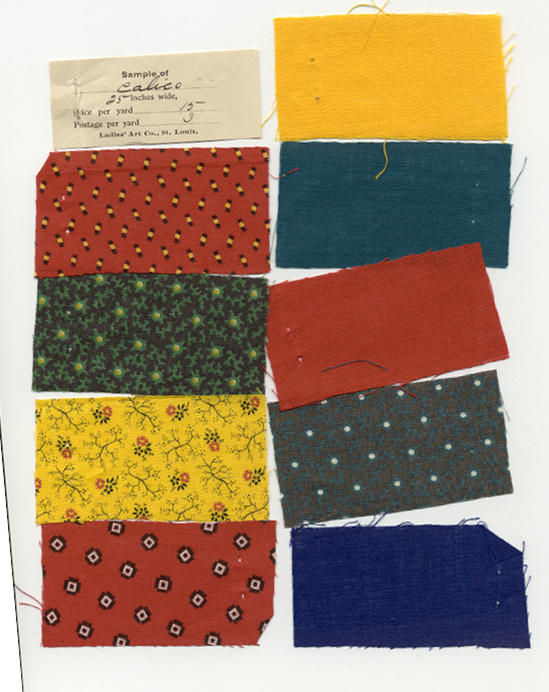 When WWII came and women began working in the factories, the decline of interest in quilt patterns and hand decorated items was evident. 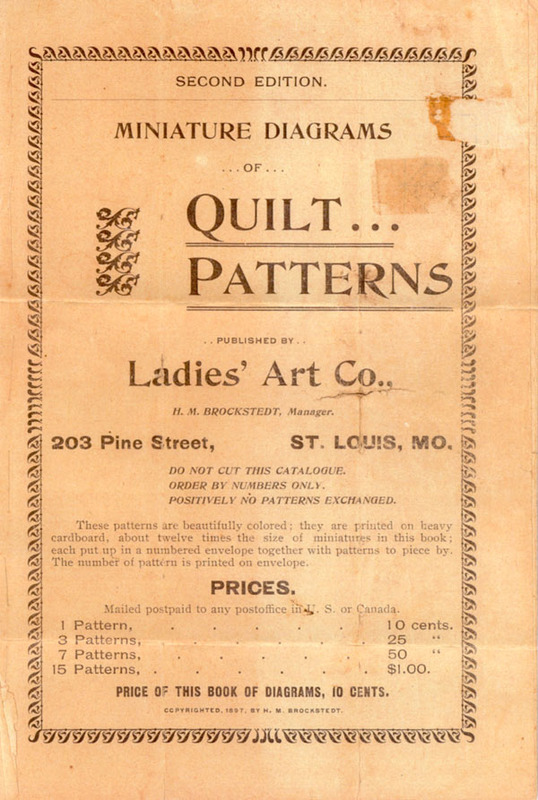 Not only did Ladies Art Company produce quilt block patterns, they also offered other catalogs containing patterns for ‘fancy work’, tatting, crochet, cross stitch and rug hooking. One could learn how to make several different types of lace, pyrography (burning patterns onto leather), beadwork and all types of embroidery. In 1922 Ladies Art Company published a catalog entitled The Book of Applique Patchwork by Deaconess. Within its eight pages some of their first quilt kits offered were listed for sale. One could purchase just the pattern, or a complete kit costing at the most, $6.00. 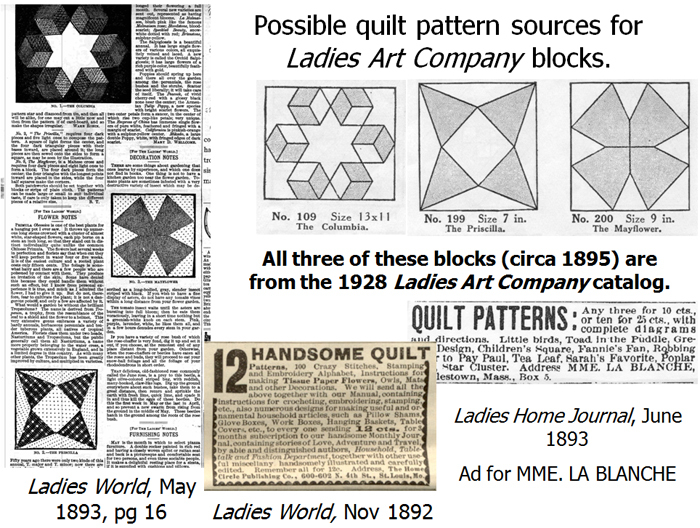 By 1928, Ladies Art Company had published a catalog with 530 quilt block patterns. Most of them were pieced blocks rather than appliqué patterns. 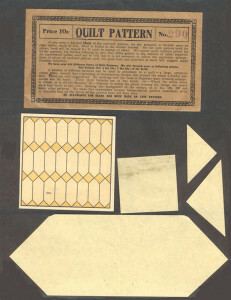 Another 12-13 quilt block patterns were sold but not published in any Ladies Art Co. catalogs. Ladies Art Company also sold fabric throughout the years. You could order a sample packet of calicos; they would come with approximately 1″ x 3″ rectangles of different colors and patterns. Stapled to the fabrics would be the width of the calico and the price per yard. This fabric sample circa 1920s. A timetable of pattern dates and company addresses is available here in .pdf format.